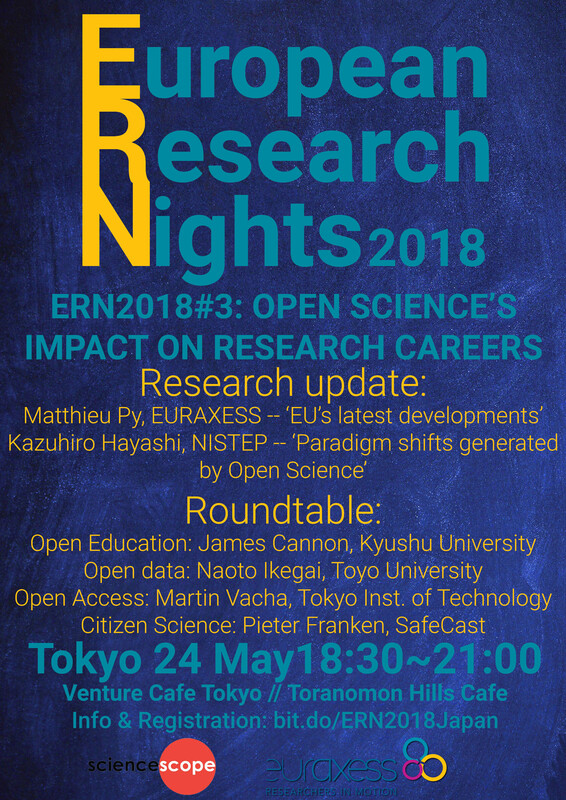 For the third edition of our European Research Nights series in 2018, we decided to focus on Open Science; and more particularly on how the different aspects of Open Science can and will change research careers. This edition is co-organised by the French-speaking researchers association Sciencescope and supported by Venture Cafe Tokyo. In a first part, an overview of the recent evolutions of the topic in Europe and Japan will be provided via two talks. In a second part, wewill invite the whole audience to take part in discussions in the form of a roundtable featuring individual researchers based in japan who are implementing specific aspects of Open Science.